Welcome to today's stop for Rachel Harris's Accidentally Married on Purpose blog tour, hosted by SizzlingPR. Find out more about the book, read an excerpt & enter to win below! Book Synopsis: One ring plus one wild night equals one crazy love Sherry Robicheaux loves men. She loves love. And she loves an adventure. So when she meets a mysterious man while working backstage at a country music concert in Vegas, she’s all about what happens in Vegas staying there. Country music superstar Tyler Blue just wants a weekend of anonymity…though there’s something about the spunky waitress with the streaks of purple hair that tempts him like no other. Until the next morning, when they both wake up with fuzzy memories…and rings on their fingers. Convincing Sherry to maintain the ruse for his public image isn’t the hardest part—it’s reminding himself that their time spent playing husband and wife in her small town of Magnolia Springs can’t last. Tyler’s first love will always be music—and the road is no place for a sweet downhome girl. Laughing, he threw open the door and tore up the drive, expecting Sherry to be right behind him. But when he reached the front door and turned around, she wasn’t on the porch. Confused, Tyler walked back a few steps and found her instead in the yard, face tilted to the sky, arms stretched to capture the liquid drops. In his experience, women tended to get all Wicked Witch when it came to the wet stuff—they freaked if it touched them. While Sherry wasn’t overly dramatic about fashion, he’d seen her tackle box filled with makeup and witnessed the application ceremony. If anyone would avoid the risk of messing it up, it’d be Sherry. But then, as he always seemed to be when it came to this woman, he’d been wrong. Right now, he was dry. He was under a roof, warm and adequately dressed to impress the in-laws. But her smile was hypnotic. Placing his hand in hers, unsure why he was even doing it, he let her tug him into the storm. As expected, it was cold. And wet. If anyone saw them out here—and with their photographic luck, people were definitely watching—they’d think he was nuts. But that didn’t matter because his adorable, silly, crazy-as-hell wife dropped his hand and began dancing. Spinning in a circle, laughing at nothing, scrunching her nose and making a Mick Jagger face as she shimmied her shoulders and swirled those luscious hips. Oh, he had some moves. Not great moves, mind you, but he could carry his own. So, with his sassy brunette watching and waiting, Tyler gave the quiet street a cursory glance, and then bopped his head. Shaking his head, a smile twitching his lips, he added his feet. Pleasure filled her eyes as she followed his every step, so he also did a Michael Jackson moonwalk, completely with a crotch grab. That sent her into hysterics. And made him feel like a damn king. Rachel Harris writes humorous love stories about sassy girls-next-door and the hot guys that make them swoon. Emotion, vibrant settings, and strong families are a staple in each of her books...and kissing. Lots of kissing. A Cajun cowgirl now living in Houston, she firmly believes life's problems can be solved with a hot, sugar-coated beignet or a thick slice of king cake, and that screaming at strangers for cheap, plastic beads is acceptable behavior in certain situations. She homeschools her two beautiful girls and watches way too much Food Network with her amazing husband. An admitted Diet Mountain Dew addict, she gets through each day by laughing at herself, hugging her kids, and losing herself in story. She writes young adult, new adult, and adult romances, and LOVES talking with readers! I am so excited to bring you the release day launch of Alicia Rae's A Beautiful Thought, hosted by Inkslinger PR!! Here's a little bit about her newest release! Be sure to enter the exciting giveaway below. I'm thrilled to be apart of today's Release Day Blitz to celebrate the release of Chelsea M. Cameron's newest New Adult book! Check out this fabulous cover, find a little bit more about the book and be sure to enter to win a $50 Amazon gift card (open internationally). 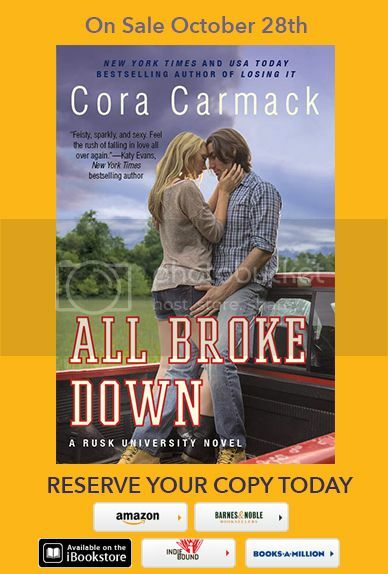 I am so excited I get to share the cover for Cora Carmack's ALL BROKE DOWN today! This is the second book in her Rusk University Series, a New Adult Contemporary Romance, which is set to be released on October 28, 2014. Published by William Morrow (an imprint of HarperCollins). I can not wait to pick up this book! Check out this cover!!! 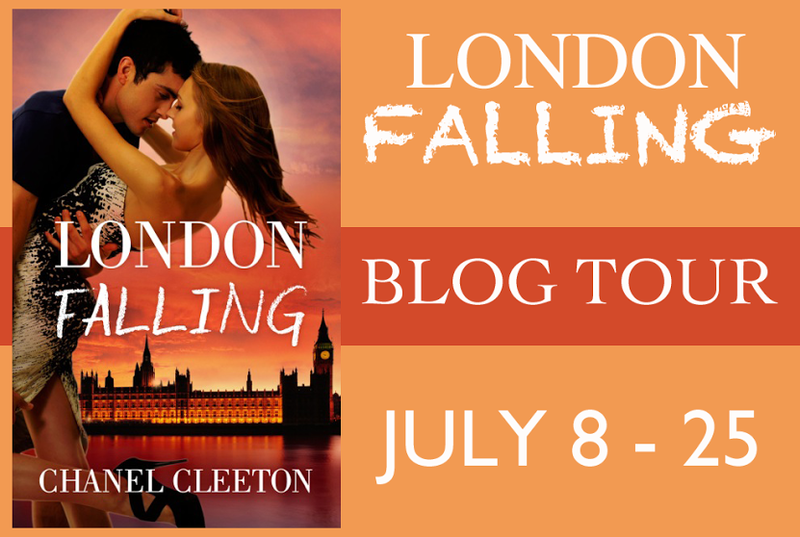 Welcome to today's London Falling blog tour stop, hosted by InkSlingerPR. Enter To Win a London Falling coffee mug, Tea, (4) signed London Falling bookmarks, (4) signed I See London bookmarks, (4) pens, a London case, and a $25 Amazon GC. Welcome to today's London Falling release day blitz to celebrate the release of Chanel Cleeton's newest book. Read an excerpt & enter to win. Don't forget to join Chanel in her Facebook Release Day party. Details below! Join the Facebook Party TODAY! Go HERE to join! Welcome to today's Release Day Launch for Courtney Cole's UNTIL WE FLY!! UNTIL WE FLY is a NA contemporary romance and the fourth novel in Courtney’s Beautifully Broken Series!! Ex-Army Ranger, Brand Killien, has always been good. A good friend, a good soldier, a good everything. . The problem is, good hasn’t gotten him anything but a crushed heart. So after licking his wounds, he decides to move on. And moving on doesn’t include being good anymore. Bad sounds so much better. Jaded and detached, Brand is determined to never open himself up to anyone again. It’s not worth the pain. Instead, he becomes closed, hardened, aloof. But then he’s called back home for a family emergency… a family that he is estranged from. A family that he put out of his mind a long time ago for very good reasons…reasons that involve secrets and pain. Reasons he tried hard to forget. But home is where the heart is, and it just might be where Brand finds his again. Why? Because home is where Nora Greene is. A fiery, red-headed spitfire, Nora is a thing from his past. A beautiful, feisty thing. When Brand left, she was away at boarding school. But she’s back now. And she wants Brand, scars and all.